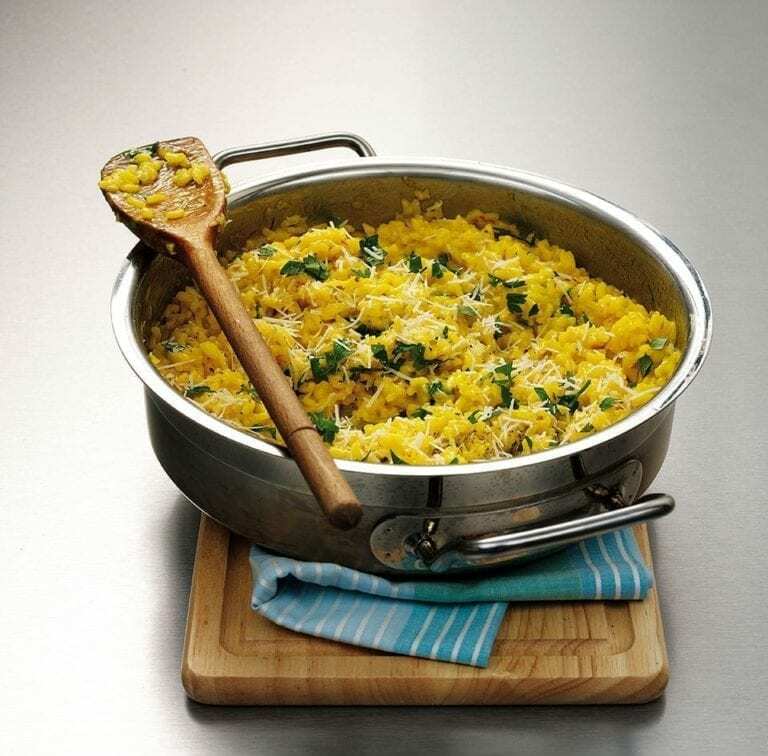 This rich dish, which originates from Milan, is just perfect for vegetarians with its mix of saffron and wine with arborio rice. Get all your ingredients ready. Heat the olive oil and half the butter in a wide, non-stick pan over a medium heat. Add the onion and cook, stirring, for 5 minutes, until softened. Stir in the saffron until it begins to release its colour, then add the rice. Stir for 1 minute to coat in the butter, then pour in the wine and bubble until absorbed. Meanwhile, put the vegetable or chicken stock in a small saucepan and keep at a low simmer. Add a ladleful to the rice, stirring until absorbed. Continue adding the stock – 1 ladleful at a time, stirring frequently and making sure it is absorbed before adding the next ladleful – until the rice is al dente. This will take about 20 minutes. You might not need all the stock. Stir in the remaining butter, cover with the lid and set aside for 2 minutes. To serve, stir in the grated Parmesan, chopped parsley and some seasoning to taste. Divide the risotto between shallow bowls or plates, top with some Parmesan shavings and serve immediately. I love this recipe because I have a soft spot for Risotto and I’m a vegetarian so it’s the perfect recipe, very comforting after a long day at work and easy to make !